Brevard county teachers and support staff responded during the shutdown by donating their time, money and food in support us. 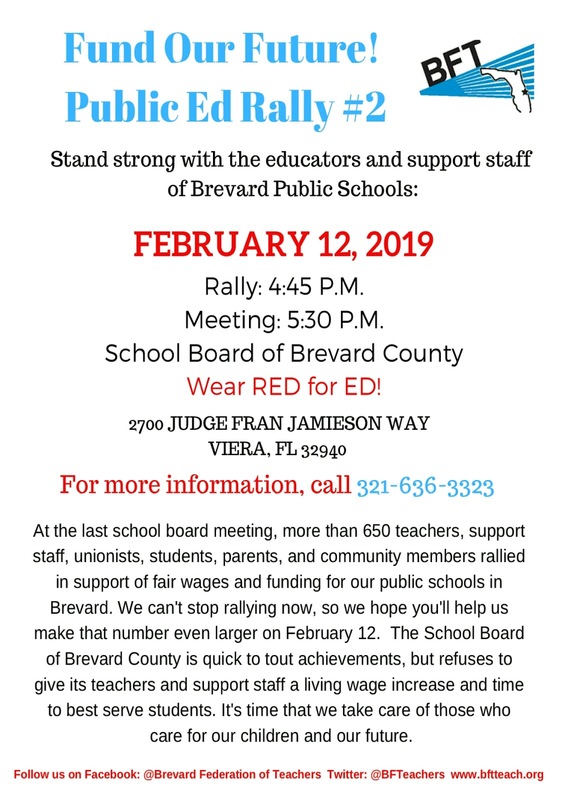 Please join me in returning our support by attending the Public Ed Rally #2. 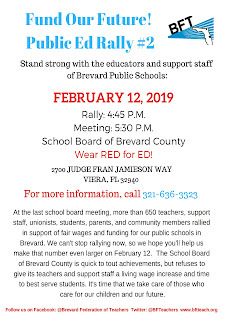 The rally is at 4:45pm, Tuesday, February 12th, 2019, 2700 Judge Fran Jamieson Way, Viera, FL 32940. I want to thank everyone for the tremendous turnout at the rally today. Please remember our work is not complete. We need to contact our federal elected officials again to convey the message that government shutdowns are unacceptable and all federal contract workers should receive back pay for this latest one. Kennedy Space Center was back open as of 12pm today. As a result, all employees working on the IMSS, KPLSS, LASSO, TOSC & ISC contracts should report to their normally scheduled shifts on Monday, January 28th, 2019, unless directed to report earlier by management. There will be a food bank distribution this upcoming Thursday, January 31st, 2019 from 12pm to 5pm at the hall. The food bank is to be administered by Second Harvest Food Bank and Hands for Healing International. It is open to the entire community so please help share this information and provide the address of the hall, 271 Taylor Ave., Cape Canaveral, FL, 32920. Rally & Food Drive Is Still On!!!! The Solidarity Rally and Food Drive will still happen tomorrow, January 26th, 2019, from 12pm to 2pm. Even though we have received encouraging news that the government shutdown will end, the proposed continuing resolution only funds the government through February 15th, 2019. As I said in a earlier blog, it is imperative that all members make every attempt to attend. We want to send a message that government shutdowns are not acceptable and that all federal contractors impacted should receive the back pay missed due to the latest shutdown. Please remember the solidarity rally and food drive scheduled for this Saturday, January 26th, from 12pm - 2pm. It is important that all members make every attempt to attend. For those that have been fortunate enough to work during the shutdown, I encourage you to consider donating non-perishable food items to the food drive. Members that are employed on the ISC contract and looking to transition to the BOSS contract should know that PAE has notified us that all job offers for represented employees are still on hold. We will inform everyone as soon as they provide us an update on the job offers. We were made aware today of concerns from members that they might not receive all of the wage/pay compensation they are entitled to for work during a base closure. These concerns need to be put to rest as we will ensure everyone receives all compensation they are entitled to per their respective CBA. In addition, conversations have been held with the companies pertaining these concerns and they agreed the CBAs will be followed pertaining base closure compensation. In a final note, I received the same suggestion from several members on financially surviving the shutdown. It was to lower your 401K deductions until the shutdown is over and we return to work. You will have to contact your employer to accomplish this and we can assist in identifying a point of contact. Please do not establish a GoFundMe page/account to raise funds for yourself. There might be ethical and legality concerns involved as we are federal contractor employees. We will contact the IAMAW legal department for guidance and provide an update on this subject. The effects of the government shutdown are a crisis that only continues to grow as it drags on. Already, as a result of the shutdown, some of our fellow members of LL2061 have received layoff notices with a termination date of 1/25/2019. As such, now is not the time to remain idle and silent. If you haven't already done so, I need everyone to contact your congressional representative and both Senator Rubio and Senator Scott to urge them to end the shutdown and return us to work. Please encourage all of your family members(include relatives nationwide), neighbors and friends to do the same. Saturday, 1/26/2019, from 12pm to 2pm. I implore all members to make every effort to attend. This is an instance where your personal actions can help influence an outcome. Below are links to find the contact info for Central Florida's congressional representatives and Florida's U. S. Senators. Please share these links with your family and friends so they can find their Congressional Representative(s). Refer to the attached flyers that have more information about the rally and shutdown relief donations. In closing, we will all get through this together by being there for each other and doing our part as a union member. Note: If the shutdown ends before 1/26/2019 the rally will be canceled. We are currently building a database for more efficient lines of communication. Please contact President Ed Grabowski 386 846 8671 or email edwardgrabowski@bellsouth.net with your personal phone number and email so that we can keep you up to date with the latest information relating to the shutdown. We will also keep you informed about the BOSS transition. IMPORTANT NOTE: if you signed up for AECOM insurance BEFORE Dec 31, 2018 (KSC 750/1500 plan) this plan IS NOT available even if you have received insurance cards. You MUST sign up again BEFORE Jan 31, 2019 OR YOU WILL NOT HAVE INSURANCE!! AECOM/Yang contract has been extended until March 1, 2019 due to the government shutdown. BOSS job offers are on hold due to the government shutdown. Several banking institutions are offering members effected by the shutdown with 12 month 0% interest loans. Launch and space coast credit unions are offering this. Local food pantries are available throughout central Florida. We realize this is tough to do but please utilize these services if you need them. We realize these are tough times for all our members. Together we are stronger. If you are working please remember other members would appreciate the opportunity to share in some the scarce hours available. United Way, one of the AFL-CIO’s national partners, supports 2-1-1, a free nationwide information and referral line that helps people find local resources they may be eligible to obtain 24 hours a day, seven days a week. Health care and mental health services. Call 2-1-1 and speak with a live, highly trained service professional in your area from any cell phone or landline. All calls are private and confidential, and assistance is available in multiple languages. Or visit 211.org to locate organizations in your community that provide support and assistance to working families in their time of need. And if you know of a worker impacted by the shutdown, please share this with them as well. ISC CBA Contract Extension Informational Meeting & Vote. There will be an ISC CBA contract extension information meeting and vote on January 25th, 2018. The meeting will take place at the Merritt Island Moose Lodge #2073 at 4:30PM. The address is 3150 N. Courtney Parkway Merritt Island, FL. Please come out for the meeting and have your questions answered prior to the extension vote. Brothers and sisters, there will be a contract ratification vote on Monday October 2nd at the Union Hall at 430pm. Saturday. Brothers and sisters be prepared for some difficult decisions. We resumed negotiations with the company this afternoon. Several economic issues were discussed and resolved today. The company presented its economic proposal today. Your bargaining committee will present a counterproposal tomorrow. We remain positive that we will present a contract that you can be proud of. Your bargaining committee met with the company on 9/25/17 and went over some of the economic package. While talks remain positive, we have a long way to go. Please remain vigilant. We will continue to work hard to bring you the best offer possible. Updates will continue. We began contract negotiations on Tuesday Sept 19, 2017 at noon. We went through the non economic issues and got some language cleaned up. There are still a couple of non economic issues tied to economics that remain open. We presented our economic package to the company on Wednesday Sept 20, 2017 and they are currently in caucus with the issues presented. We will resume negotiations on Monday Sept 25, 2017. Your negotiating team is working hard to present you with the best contract possible. Rocky Blabey, Brian Ellis and Mike Consolazio. 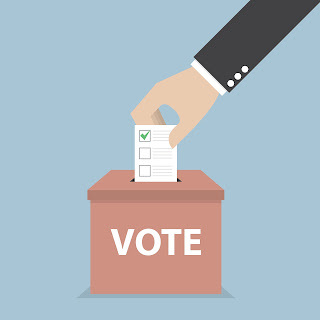 Please be advised that the tellers for the ISC contract ratification vote has counted all the ballots and the membership has chosen to ratify the contract proposal. Your Negotiating Committee would like to thank all the membership for attending the presentation and exercising your right to vote. Your Negotiating Committee, along with DBR Walker, BR Mrdjenovich and Organizer Kevin Dimeco, met again with the company to try and iron out some last minute contract issues. After two more passes the company presented its last, best and final offer. The committee spent the rest of the afternoon assembling a summary of all the proposed contract changes. Please look for the signs directing you to the appropriate door to sign in. We purposely have multiple doors to alleviate any large back ups getting you in. Sign in is by your last name. Come out and listen to the presentation. Vote on the company's last, best and final offer. Don't let someone else decide your future. 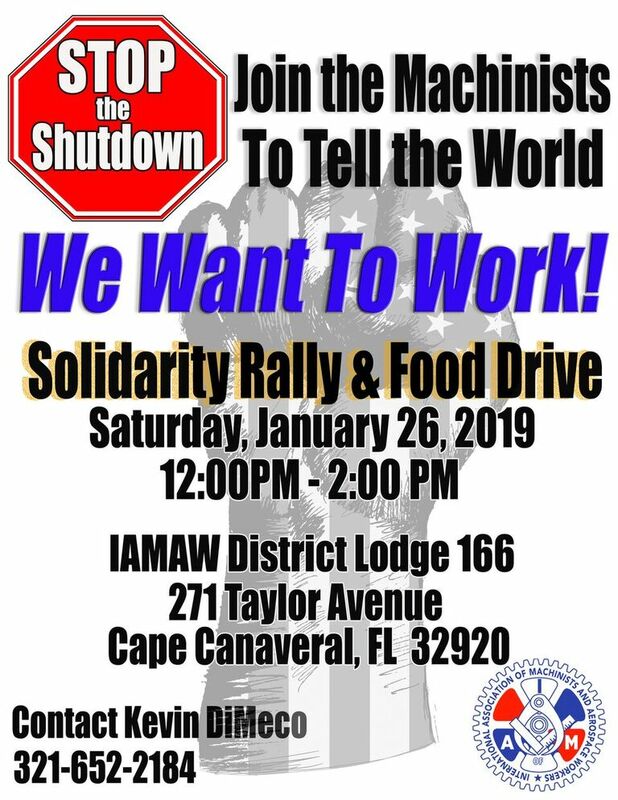 We were able to obtain the meeting hall at an earlier time so the 2nd shift presentation will now be held at the Holiday Inn Express located at I 95 and 520 (301 Tucker Lane Cocoa FL) Doors will open at 1230pm and the presentation will begin at 1pm. Voting will commence after the presentation. This meeting is for 2nd shift only. Look for another update this afternoon. Your Negotiating Committee met again with the company today. DBR Walker, BR Mrdjenovich and Loren Almeroth joined us at the table. We passed across another economic proposal to the company. Most of the conversation centered on insurance. We will meet again Monday morning. Our next membership meeting will be Tuesday March 31, 2015 at the Holiday Inn Express (301 Tucker Lane Cocoa FL) located at I 95 and 520. Doors will be open at 4pm. Presentation will start 4:30pm. We will present you with the contract proposal and take any questions. Voting will follow the presentation. We will have a separate presentation for 2nd shift at the District union hall at 271 Taylor Ave Cape Canaveral FL starting at 1pm Tuesday March 31, 2015. Contract voting will be immediately after the presentation. Your Negotiating Committee, along with DBR Walker, BR Mrdjenovich and Loren Almeroth, met with the company. The morning meeting didn't result in much movement. However, the afternoon meeting did produce some positive progress. We will be meeting again tomorrow to try and move forward on unresolved issues. We are currently working on times for 2nd shift. Your Committee would like to take this opportunity to thank our membership for supporting us. Your Negotiating Committee met again with the company today. After morning and afternoon sessions some progress was made. DBR Walker submitted a written request for additional information pertaining to insurance issues. We will meet again with the company in the morning. Thanks to every member who attended our informational town hall meeting yesterday. We hope everyone was able to understand the difficulties ahead. It is our commitment to you and your families to do our very best to get a fair and decent contract. Your Negotiating Committee met today to evaluate the companies first economic proposal. We will meet again with the company in the morning. We look forward to seeing you at the Town Hall meeting tomorrow afternoon. Your Negotiating Committee, along with DBR Walker, BR Mrdjenovich and Loren Almeroth, met with the company today. We exchanged economic proposals this afternoon and the companies proposal was exceedingly unprecedented and disappointing. Negotiations will continue next week. We will give you a report on the status of negotiations on Tuesday at the town hall meeting. Your Negotiating Committee, along with DBR Walker, BR Mrdjenovich and Loren Almeroth met again with the company today. We exchanged counter proposals for more non economic language and had one T/A today. We should wrap up most of the non economic issues in the morning and will exchange initial economic proposals in the afternoon. Your Negotiating Committee along with DBR Walker, BR Mrdjenovich and Loren Almeroth met with the company today. We were able to T/A several more non economic items. We are close to concluding the non economic portion of the contract. We are meeting again with the company in the morning. Please note: We will hold our informational town hall meeting for 2nd shift on Tuesday March 24th at 12 noon at the union hall. The town hall meetings are for informational purposes only. They ARE NOT for contract ratification vote. Your Negotiating Committee, along with DBR Walker and BR Mrdjenovich met with the company today. Loren Almeroth, an economist from the Grand Lodge joined us at negotiations. Several more T/A's were reached today and we are moving closer to finishing the non economic portion of the contract. We tentatively will meet again with the company tomorrow. We are going to hold a informational town hall meeting for the membership on Tuesday March 24th 2015. The meeting will be held at the Space Coast Convention Center (Holiday Inn Express) located at 301 Tucker Lane Cocoa FL. This is the Holiday Inn Express at I 95 and SR 520. The meeting will start at 4:45pm. Your Negotiating Committee, along with DBR Walker and BR Mrdjenovich, met again today with the company. After another round of counter proposals, we were able to T/A several non economic items. We also discussed at length, several items which are contentious for both sides. The committee is meeting tomorrow to work on these issues. We are scheduled to meet again with the company next Monday. We will keep you informed through this blog as to any important news that needs to be shared with our members. Your Negotiating Committee, along with DBR Johnny Walker and BR Nick Mrdjenovich, met with the company today. We exchanged counter proposals and jointly T/A'd (Tentative Agreement) several non economic issues. We are meeting again in the morning and hope to make more progress throughout the day. Your ISC Negotiating Committee was unable to meet with the company today due to unforeseen circumstances. The Committee is going to meet tomorrow to continue preparing our counter proposals, reviewing the rest of their non economic proposals and to do more research. We will keep you informed through this blog as progress is made. Please remember that communications about official Union business should be made in writing through the normal chain of command, such as through a steward, local lodge official, or Business Representative, as appropriate. This website is not a substitute for official communications. © 2010 IAM Local Lodge 2061. All rights reserved.